As strong as our members– the Marengo-Union Chamber of Commerce is a guiding force for the business community in the southwest corner of McHenry County. The businesses collectively have much to offer to the residents of this charmingly rural area. We invite you to read through our site and visit our office, conveniently located at 116 S. State St., Marengo, IL 60152. 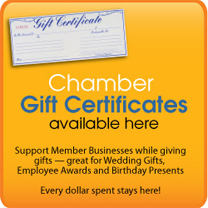 To learn more about the benefits of Chamber membership, click here. The Marengo-Union Chamber of Commerce was founded in October, 1970. The Chamber is a catalyst for business growth and development in the Marengo-Union area providing advocacy and support services for its members. It is the common vehicle by which the mutual interests of all segments of the community can work together for the good of the entire community. Through the profitable operation of business all other benefits are derived. Only by succeeding in this endeavor can we provide the jobs and produce the wealth to finance all of the governmental, civic, cultural and charitable needs that our community is faced with every day. Helping your business succeed is the business of the Marengo-Union Chamber of Commerce. From answering your questions and providing a host of useful information to promoting growth in our county, there are people working everyday to help make the Marengo-Union area a place where businesses thrive and success lives. The chamber is dedicated to taking all steps necessary to maintain and enhance the Marengo-Union business climate so that entrepreneurs and organizations will be willing to invest their resources here and see their businesses flourish. McHenry County remains one of the fastest-growing counties in Illinois. At the center of the Marengo-Union area’s growth and development is the Chamber of Commerce. The Chamber has a finger on the pulse of the community and is able to identify and target issues of importance to businesses in the County. Within the Chamber, businesses of all sizes have a strong voice and powerful impact on important community issues. The Chamber facilitates the establishment of new businesses and the expansion of existing ones, creating more paying customers to consume more goods and services, more jobs closer to home and a more balanced tax base. The Chamber has a strong alliance with County government, education, homeowners and developers to create a better community for all!